The world’s greatest cities are made up of great neighborhoods. Neighborhoods that possess unique personalities, proud residents, and rich histories. New York City’s Garment District has all of these components, but a major image issue kept many New Yorker’s out of the neighborhood for decades. The Garment District makes up roughly 20 blocks in Midtown Manhattan, flanked by Penn Station to the South and Times Square to the North. Historically, the Garment District was the center of all garment manufacturing and fashion design in the United States, and amongst the most important fashion epicenters in the world. From the early 20th century through the 1960s, 100% of the neighborhood’s business was fashion. During the daytime, the neighborhood was alive with hundreds of thousands of garment workers: designers on the hunt for fabric, seamstresses and tailors heading to work, loud trucks bringing fabrics and garments in and out of the neighborhood and men occupying the already busy sidewalks with racks of clothing. At night, the neighborhood became a different place altogether. GDA started a public art program and amongst the first projects was an arts festival meant to introduce New Yorkers to the arts community within the neighborhood. Beginning in the 1970s, garment manufacturing began its exodus from the neighborhood. According to Blair, manufacturing first began heading to states in the South that were not unionized and thus cheaper. Today, much of fashion manufacturing has moved overseas in search of inexpensive labor. As a consequence, many of the neighborhood’s factories and warehouses became vacant and the district began going through an identity crisis. The Garment District Alliance is made up of building and business owners who initially sought to solve basic problems like safety and cleanliness. They hired private security and a cleanup crew to tackle the area’s graffiti. Most importantly, lighting was installed to make people working later into the evening feel more secure on their way home. A central plaza was built and equipped with plants and seating to alleviate sidewalk congestion. Slowly new tenants from other industries, particularly in the creative fields, began renting out vacant spaces. The game changer happened in 2005 when the city re-zoned a portion of the Garment District that would allow for the construction of hotels and residences in old lots that were smaller than 70,000 square feet. This brought in dozens of hotels and 1 million visitors to the area annually who are looking for restaurants, bars, cafes and an active street life. The Garment District Alliance decided to tap into an underground network of artists that were using old manufacturing spaces as artists’ studios. Most people, according to Blair, had no idea that the artists were even in the neighborhood. They started a public art program and amongst the first projects was an arts festival beginning with an Open Studio meant to introduce New Yorkers to the arts community within the neighborhood. Making the artists in the neighborhood visible became one of the Alliance’s key strategies. Today, they host a series of outdoor interventions and public art projects in a plaza built by the city. The public plaza is equipped with tables, chairs and plants and rotating installations. Orangenius is teaming up with the Garment District Alliance to host a global contest that calls for art submissions from artists worldwide. 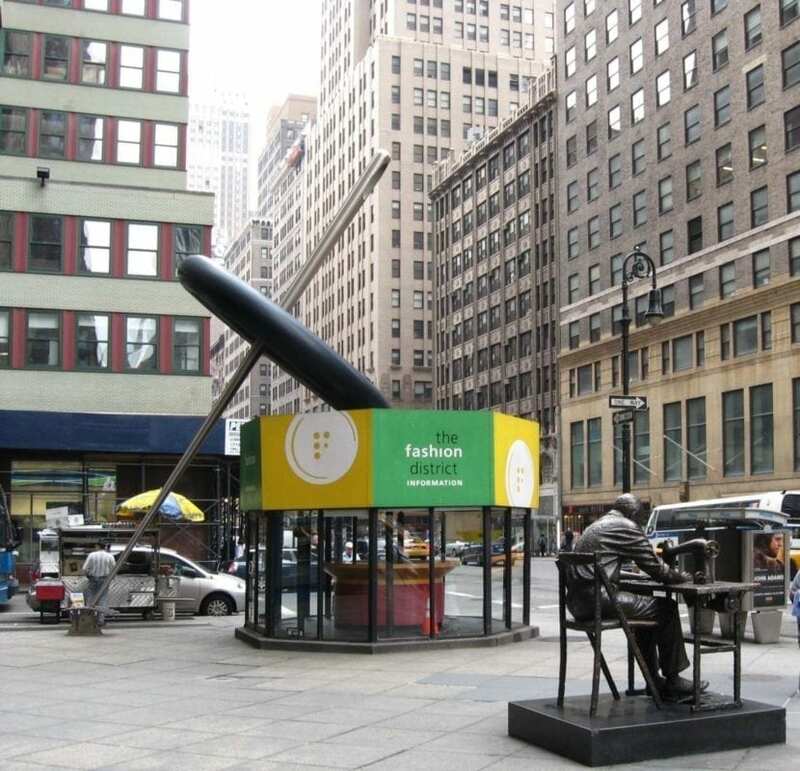 The Garment District annually gives artists an opportunity to submit their work for a large public art opportunity that takes over the Garment District. Orangenius is teaming up with the Garment District Alliance to host a global contest that calls for art submissions from artists worldwide. 90 artists’ works will be chosen by an esteemed jury of art professionals to create an aerial art gallery. Works will be strung on lampposts through the heart of Midtown Manhattan and remain on display for 2 months with an expected 21 million views from New Yorkers and visitors, alike. The top three winners will receive cash prizes and the grand prize winner’s work will appear on numerous printed and online marketing materials for the Garment District Arts Festival which takes place October 18-20. Artists interested in submitting work can submit here. The next time you are in New York City and in need of an arts fix, don’t hesitate to explore the Garment District, which thanks to decades of hard work from Blair and her team have become a vibrant area with so much more than fashion. How could I get involved and participate in the garment district as a Designer and Artist?